City of Collinsville commissioned Counsilman-Hunsaker to provide aquatic expertise in the development of a new community aquatic center. This aquatic center has been a highlight to the community of Collinsville and has had two separate additions since 1998. In 2003, the city expanded the waterpark by introducing a splash play area coined, “Monsoon Mountain.” The five-level interactive aquatic feature invites families to climb nets, glide down six waterslides, and become soaked by 317 gallons of water from an oversized tipping beaker. 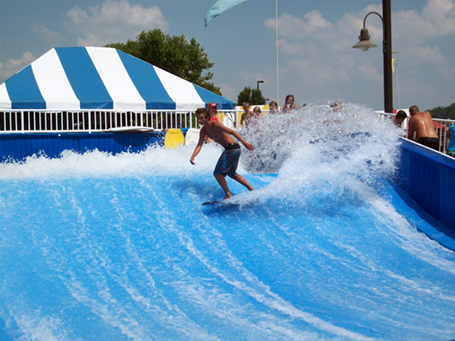 In 2006, additional aquatic features were added to the waterpark: the FlowRider and a 25-yard four lane lap pool for fitness and training. The objective was to provide more water features that appeal to teens and adults, to increase guest’s length of stay, and generate more revenue and attendance.